This weekend I decided to host a second Thanksgiving with my friends from college. Prior to the actual holiday, this seemed like a great idea, as if no one could ever have enough turkey and stuffing. Fast forward nine days, two Thanksgiving meals and lots of leftovers later, I discovered that, while the turkey does get a little less exciting, any reason to get your friends together and share a meal is a good one. I roasted my first official turkey using Alton Brown's Good Eats Roast Turkey recipe, complete with brining bag and aromatics. It turned out pretty well, if I do say so myself. The next day, I was left with a whole lot of leftovers. Not wanting to throw the turkey carcass (a really horrible word) away, I decided to make some soup with it. Let me tell you, the aromas in my apartment on Sunday rivaled actual Thanksgiving day, and it was super easy. A friend stopping by even said, "How homemaker-ish of you!" That's right, I'm a soccer mom living a single girl's life, and loving every minute of it. This soup embodies many of the tastes of Thanksgiving, with fresh sage, turkey, and lots of vegetables, but has the added bonus of being healthy. You won't feel guilty after eating a big bowl, even if you have it for lunch three days in a row (which I may or may not have done this week, don't tell!) On cold winter days when it's dark by 4:30, turkey soup will warm you right up. Plus, while it's simmering you'll have time to drink a mug of mulled wine and watch Home Alone, and who doesn't want to do that? First, put your turkey in a large stockpot, add an onion (quartered), 3 stalks of celery, and a bay leaf and cover with water. Bring it to a boil and simmer for about 1 1/2 hours. This isn't the prettiest part of the process, but it definitely smells the best. Remove the turkey from the stock pot and put in a bowl to cool. The water in the stockpot is now delicious broth. Pour it through a strainer or some cheesecloth to remove any remaining solids. Set it aside and let it fully cool, letting it sit in the fridge if possible. This will allow the fat to separate and float on top. Scoop it off and discard. Once the turkey carcass has cooled enough so that you can touch it, remove all the meat from the bones, discarding everything else. Slice it into bite sized pieces. Back to the stockpot. Heat 2 Tablespoons olive oil and saute one minced onion, the remaining celery (sliced), and all of the carrots (sliced). Cook until tender, about 5-7 minutes. Add a small handful of chopped sage leaves, along with 2 cloves of garlic, minced and cook for 1 more minute. Add the broth, remaining bay leaf, turkey, rice or barley, and your vegetables. I used a bag of frozen green beans and a bag of frozen corn, but you can use whatever veggies you prefer. It's a great way to use up leftovers. Bring everything to a boil and then simmer for 15 minutes. Add salt, pepper and thyme to taste. So go ahead, grab a spoon and taste it! Remember, you can always add more salt, but you can't take it out. Simmer the soup for at least 30 minutes and up to several hours longer, depending on how much time you have. A pot of soup on the stove makes for a pretty cozy Sunday, so I don't recommend that you rush. Serve piping hot in a pretty bowl and enjoy! **Once I made this enormous pot of soup, I realized I might have solved the problem of what to do with the turkey carcass, but I had no idea what I was going to do with all this soup! Luckily, soup is easily frozen and makes for great leftovers. Once it cooled, I poured the extra soup into some Ziploc bags and froze flat in my freezer. That way, I can stack them easily and they won't take up too much space. 1. Put a leftover turkey carcass (with some meat still on the bones) in a large stock pot and cover with water. Add one onion, quartered, 3 stalks of celery and 1 bay leaf. Bring to a boil. 2. Simmer the turkey for about 1 1/2 hours. Remove the turkey to a large bowl and let cool. Through a strainer or cheesecloth, strain the water, which will now be broth, from the stock pot and set aside. 3. In the stockpot, saute 1 minced onion, the remaining celery, sliced, and all of the carrots, sliced, in olive oil until softened, about 5-7 minutes. Add the garlic and fresh sage and cook for 1 minute longer. 4. Pour the broth into the stockpot and add the remaining bay leaf. 5. 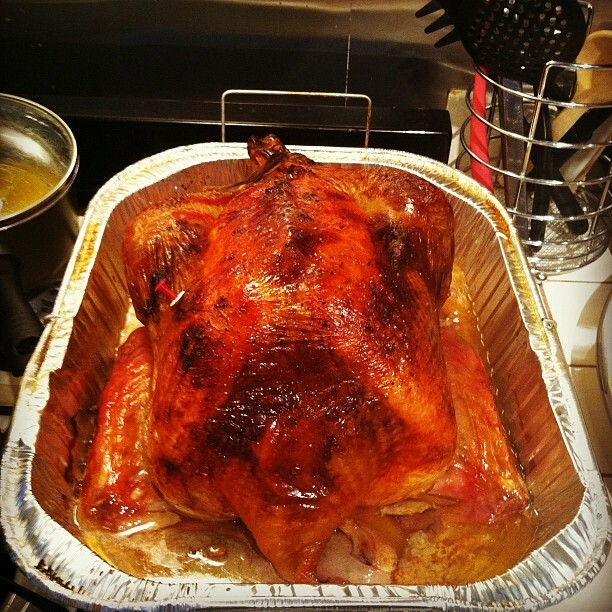 Once the turkey is cool enough to touch, remove the meat from the bones, discarding everything else. Slice the turkey into bite-sized pieces and add to stockpot. 6. Add vegetables to the stockpot and bring to a boil. Simmer for 15 minutes and season with salt, pepper, and thyme to taste. 7. Simmer for 30 minutes to several hours. 8. Serve piping hot, preferably with a slice of crusty bread or crackers. Note: Soup can be frozen for up to 6 months.